With over 95 years experience we've worked with thousands of businesses up and down the country and understand the constant demand for wholesale gift wrap. No matter what time of year there is always a birthday just around the corner, which is why it's vital you stock a selection of wholesale gift wrap to cater for all your customers needs. With over 95 years experience in the wholesale industry we’ve worked with thousands of businesses up and down the country and understand the constant demand for wholesale gift wrap. No matter what time of year it is there’s always a friend or family member’s birthday just around the corner or a work colleague's leaving do, therefore it’s vital you stock a selection of wholesale gift wrap to cater for all your customers’ needs. For those looking to wrap larger presents or more than one gift we stock a large selection of wholesale roll wraps available in 2m and 3m rolls. Varying in pattern and design we stock wholesale gift wrap to suit everyone. For females there’s the selection of contemporary designs or the vintage rolls, for men there’s the classic roll and for children there’s a selection of Disney Frozen wraps and a collection of Juvenile assorted rolls. We also stock more generic wholesale gift wrap like our Foil Rolls and Foil Roll Wrap Celebrations Mix. 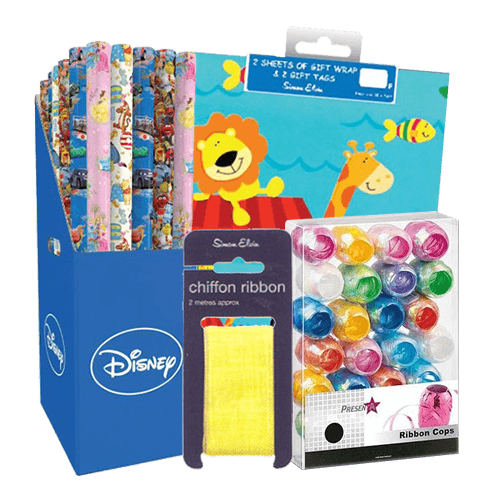 If it’s something more specific your customers are looking for then our wholesale gift wrap collection contains a number of flat wraps that are more specifically designed and less generic. For example there’s an Anniversary Gift Wrap, Wedding Bear Car Gift Wrap and Wedding Floral Gift Wrap. For that added touch our range of wholesale gift wrap contains a selection of Chiffon Ribbon available in various colours, Metallic Curling Ribbon, Confetti Bows and other decorative features. We take great pride in offering exceptional customer care along with a reliable and timely delivery service. New customers can benefit from a 10% discount on their first order. For more information on purchasing wholesale gift wrap call us on 01254 306840.